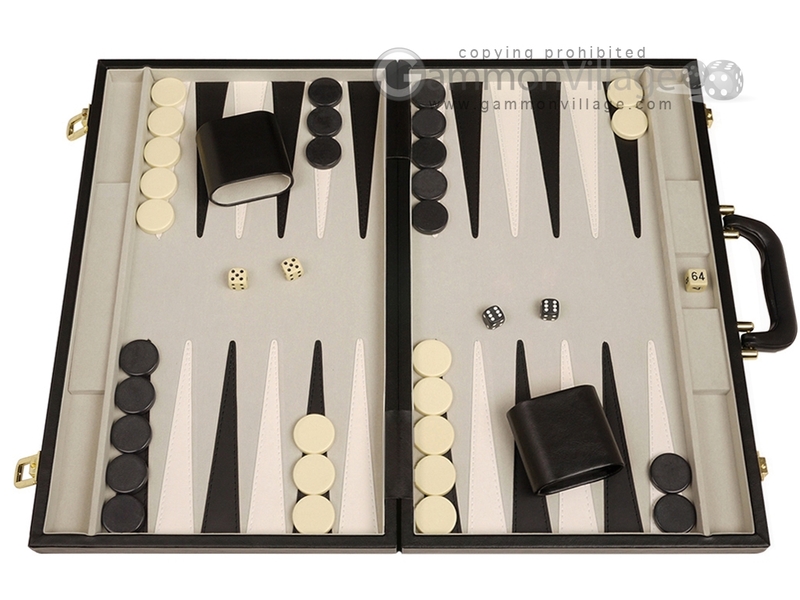 This classic 15-inch black backgammon set is one of our most popular backgammon sets. It combines elegant style, quality craftsmanship, and a wonderful playing experience – all for an incredible price! This backgammon set provides a large enough playing surface to really enjoy the game, and yet is portable enough to throw in your backpack or back seat and take along for the trip. With its sturdy and rugged handle, solid brass latches, and strong frame, this backgammon set will last a very long time and will give you years of backgammon thrills. Closed Length: 15" Width: 10" Height: 2 1/2"
Open Length: 15" Width: 20" Height: 1 1/4"
Page P4620 Copyright © 1999-2019 GammonVillage Inc., USA. All rights reserved.